Purchase your tickets today for our 2018-19 Season! In 1964, a group of friends, colleagues and classmates came together with a common goal—to explore and perform music they were not hearing anywhere else, the cantatas of J.S. Bach. 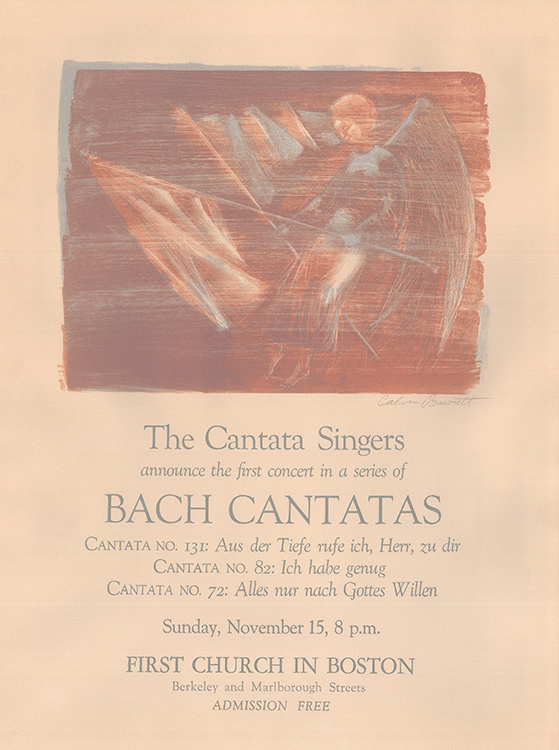 Only a few of the cantatas had been recorded, and even those few seldom appeared in live performances. That early commitment to the exploration of unfamiliar music has guided Cantata Singers for the past 53 years, and the same desire to explore and share unique and powerful musical experiences remains the core of Cantata Singers’ mission today. By the early 1970s, Cantata Singers, under the baton of John Harbison, took its place as an innovative leader, and the repertoire broadened to include both earlier and much later music. Never straying from the goal of giving Boston’s audiences fresh musical experiences, the chorus and ensemble soon took to exploring the complex ways old and new music can interact onstage. Cantata Singers also began to record commercial albums, preserving and sharing expertly performed music of all times, from Bach’s cantatas to new works by Harbison himself. 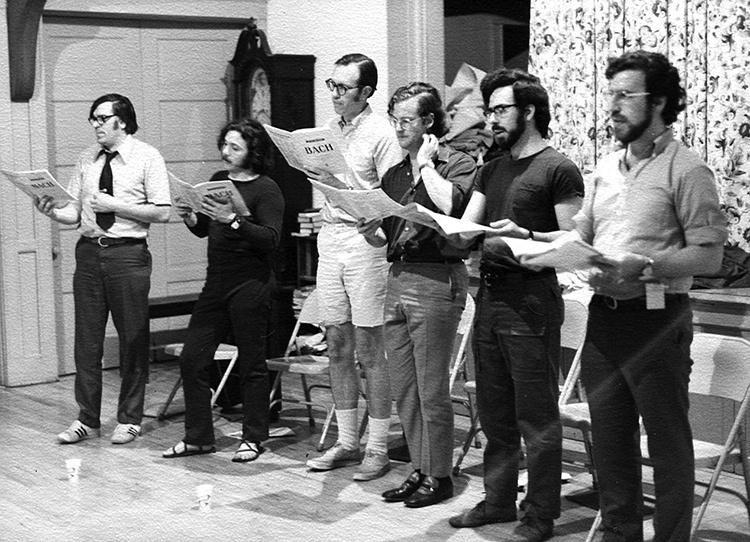 In 1982, Cantata Singers began an era of growth and exploration. With Music Director David Hoose, Cantata Singers began to redefine the choral-orchestral canon, presenting treasured icons alongside both new music and historic gems that might otherwise be lost to obscurity. He has led the organization in the commissioning and premiering of fourteen significant choral-orchestral works, the first of which, John Harbison’s The Flight Into Egypt, won the 1987 Pulitzer Prize in Music, and the most recent of which, Elena Ruehr's Eve, received its world premiere on the first concert of our 2014-15 season. In 1990, Cantata Singers commissioned Donald Sur to compose his Slavery Documents, the first of three large choral-orchestral works based on texts that focus on the scourge of slavery. Donald Sur’s, T.J. Anderson’s and Lior Navok’s subject matter and music interact in ways that continue to resonate with the group, just as the words and music of Bach have since 1964. With Hoose, the group has recorded works of Bach, Schütz, Schein, Schoenberg and Stravinsky, as well as music of the American composers Irving Fine, Seymour Shifrin, Peter Child, Charles Fussell and Harbison. Twenty years ago, Cantata Singers launched Classroom Cantatas, an education initiative in Boston’s underserved schools that marries music-making and the academic core curriculum to help children find their creative voice. Teaching Artists—performers from Cantata Singers’ acclaimed ensemble—work directly with elementary-school students, guiding them to compose and perform original songs about subjects they are studying in class. Since its inception, Classroom Cantatas has helped develop the creative potential of thousands of young people in Boston. The organization’s commitment and dedication to challenging programming, including the commissioning of new works, was acknowledged in 1995, when the group was awarded the ASCAP/Chorus America Award for Adventurous Programming of Contemporary Music. Cantata Singers audiences have come to believe in the organization for its values: the strength of its original artistic offerings and for its highest standards of performance.